The Strymon Deco is an ambitious attempt to capture all the nuances and effects that can be achieved with two reel-to-reel tape decks in a single stompbox. While some pedals try to simulate tape echo or double-tracking effects, the Deco covers a huge range of tape style flanging, chorus, slapback echo, and longer tape echo delay up to 500ms. There’s even tape style saturation to add extra warmth, grit, and overdrive to your sound. Strymon have proven with their masterfully crafted TimeLine, Mobius, BigSky, DIG, & El Capistan pedals (to name a few) that they’re up to the task of tackling just about any type of effect, and the Deco looks like their next DSP powerhouse to provide guitarists with yet more unique sounds that you won’t find in any other pedal. Let’s talk features and get the tape rolling. The Deco is housed in Strymon’s familiar smaller aluminum enclosure like the El Capistan & DIG pedals, only this time sporting an electroless nickel plated “chrome” look instead of the usual anodized coloring. The arrangement of knobs, jacks, and foot-switches is similar as well for an overall appearance that fits in with Strymon’s growing family of effects. 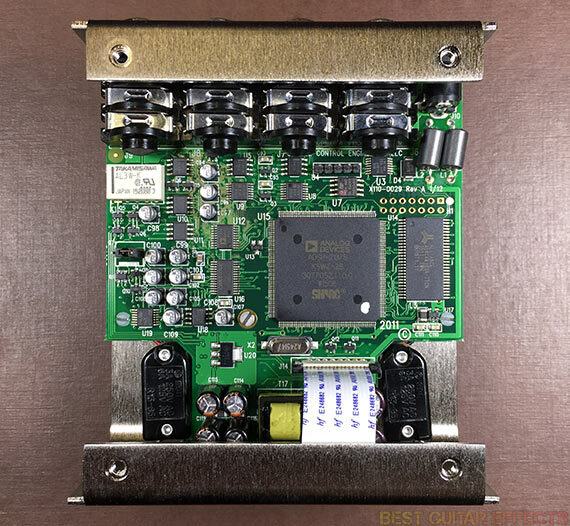 On the inside the stacked PCB’s are orderly with components carefully laid out, the Analog Devices SHARC processor being primarily responsible for computing and conjuring the Deco’s tape-inspired magic. The whole package is a work of precision engineering in pedal form. While the knobs cover the basic functionality needed for general use, pressing and holding the 2 foot-switches lets the knob adjust other hidden parameters. Saturation & Volume control High Trim & Low Trim, respectively. The Blend knob gives you up to 3dB of Boost/Cut. The Lag Time adjusts the Auto-Flange Time. The Wobble knob enables and disables Wide Stereo Mode. We’ll discuss these features in use in a moment. The pedal features a single mono in, stereo out configuration as well. If you want to use the Deco in a full stereo setup, you’ll need a TRS Y-cable with a ¼” stereo plug and 2 ¼” inputs. Then you’ll need to open the pedal and switch the jumper from Mono to Stereo input operation. It’s definitely worth trying if you have a stereo setup. An EXP jack lets you use an expression pedal, tap tempo foot-switch (for adjusting Lag Time), or the Strymon Favorite switch for recalling a single saved preset. 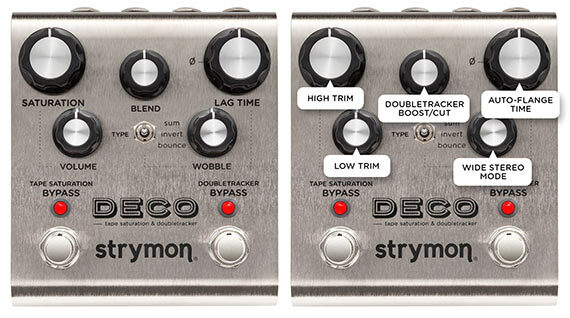 Visit Strymon for more info about the Deco. As fascinating a concept as the Deco is, I wasn’t as excited about this pedal as I should have been until I plugged it in and played it. I think it might be a little difficult for some younger guitarists to appreciate what the Deco aims to do and what exactly it has pulled off. Simply put, the Deco is the most satisfying and easy to use modern tool for replicating the effects and tonality that can be achieved by using a pair of vintage reel-to-reel tape decks. The Deco is separated into 2 effects sections, each with their own Bypass foot-switch. On the right is the Doubletracker which provides a simple 3-knob layout for manipulating and mixing audio between the 2 virtual tape decks. There’s also a switch for setting the decks to be in phase (Sum), reversed or flipped 180 degrees (Invert) for correcting phase issues or changing tonality, or to send the output of deck two to the input of deck one for a more expansive sound or ping-pong like delay effects (Bounce). On the left is the Tape Saturation section which gives you controls for Saturation amount and overall Volume output level. On the left are the Deco’s primary parameter controls. On the right are the sub-parameters accessed by pressing and holding both bypass switches while turning the appropriate knob. Let’s get down and dirty first. I was initially very skeptical about the digital saturation as most digital overdrive and distortion effects fall short of their analog counterparts. But it’s the nuances of the Tape Saturation that make the sound of the Deco so unique. If you think about how tape is utilized in the studio, it’s as a medium for recording audio. The sum of your entire guitar signal would be recorded to tape during audio tracking. 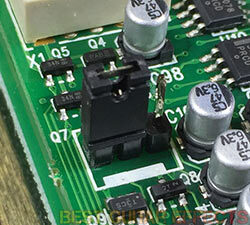 Thus, the Deco is usually best suited at or near the end of your entire signal chain. You could put it somewhere in the mix with your delay and reverb pedals, in your amp’s effects loop, or maybe even inserted after the microphone preamp that’s miking your guitar cab (Deco has a Studio Mode specifically for this type of application). The kind of saturation you achieve from driving the input of a tape deck is different from what get from putting a fuzz, distortion, or overdrive pedal in front of your amp. That’s not to say you shouldn’t try it in front of your amp (as that sounds pretty good, too), but keeping in mind the perspective of how tape was used helps bring out the best of what the Deco offers. Even it you keep the Saturation set very low, you’ll still notice a subtle hint of the Deco’s character and mild compression applied to your signal. As you increase the Saturation you’ll be treated to additional warmth that can extend up to a full-on tape flavored overdrive. The compression adds a smooth pillowy feel to the sound at higher settings that reminds me of optical compression. This grit imparted on your sound is surprisingly pleasing when it’s placed in front your amp or in an effects loop after your preamp. The sound doesn’t get overly harsh on the top-end, but there’s a sub-parameter for High Trim if you want to tame it or darken your sound a little. A sub-parameter for Low Trim helps reduce low-end if the saturation gets a little boomy. This is useful with higher Saturation settings and especially when using neck pickups with lots of low-end presence. The tone Trim settings apply to both the Tape Saturation and Doubletracker effects, affecting your overall tone. The Deco’s Doubletracker is in a league of its own in terms of the range of effects it achieves. While there are plenty of tape echo inspired effects (including the Strymon El Capistan dTape Echo), never before has one pedal produced such a wide range of classic tape effects. The Blend knob sets the balance between the 2 decks. Keep it around noon when starting out get a feel for the different effects. At the lower Lag Time settings left of noon, you’ll experience tape flanging effects. When you bring the knob up to the area between 12-1 o’clock you’ll hear tape chorus doubling effects. Setting Lag Time between 1-3 o’clock increases the timing between the decks for a slapback tape echo. And bringing the Lag Time up past 3 o’clock induces a full on single repeat tape echoes up to 500ms. For all the various Doubletracker effects the Wobble knob is used to bring in a subtle to more intense modulation of tape speed to create movement. This will let your flange sway back and forth even. You can even achieve through zero flanging by dialing in the Lag Time around 9 o’clock with Wobble around 10 o’clock. The Wobble also adds the subtle movement for authentic tape chorusing sounds. When you’re dialing in slapback or tape echo effects, the Wobble with induce some of that “wow and flutter” style warped pitch modulation. If you keep Wobble at minimum while dialing in the Lag Time at lower values, you can create interesting filtered tones. Try flipping the phase between Sum & Invert to find an interesting filtered sound that adds color to your music. Aside from the handy phase adjustment the Sum & Invert settings provide, the Bounce mode adds an extra layer of dimension to your sound. By feeding the output of deck 2 back into deck 1, you’ll achieve a bigger sound with an extra echo repeat being heard on the second deck. It’ll make the flanging somewhat less prominent when using low Lag Time settings, but the chorus sounds are interesting in this mode. You’ll find the Bounce setting most useful for adding an extra repeat to your delays. It’s worth noting that in most cases, if you’re chasing authentic vintage inspired tape effects, you’ll probably want to use the Tape Saturation and the Doubletracker together. This gives you the full experience of tape effects and tape tone. Even with lower Saturation settings the warm blanket of tape tone imparted on the Doubletracker’s effects is simply gorgeous. It’s not mandatory, of course, and you’ll also find appreciation for the unsaturated, hi-fi sounds of the tape effects on their own. It’s just as tempting to leave the Tape Saturation always-on for a signature tape coloration that enhances your sound. You can have a lot of fun using the Deco in stereo. Even if you don’t normally run a stereo rig, try feeding your guitar from the mixer into the Deco via insert and split the output to the left and right output monitors or PA speakers. If you are running 2 amps, put the Deco in the effects loops of both and get ready for some fun tape echo excursions. The pedal has 2 outputs for running it to the front of 2 amps, but if you open the pedal and set the jumper to stereo input, you can use a TRS cable for true stereo I/O operation and more flexible positioning in a stereo effects chain. The default stereo mode already sounds impressive, but if you set the Deco to Wide Stereo Mode you’ll send decks 1 & 2 to the left and right audio channels, respectively. From here you can adjust the Blend knob to opposite extremes to hear your signal on each side of the stereo field. The sounds are simply huge. When using Bounce mode with tape echo in regular stereo mode, the second repeat bounces back to the left channel. When in Wide Stereo Mode, the second repeat stays on the right. Subtle differences, but each worth exploring to find the sound you’re looking for. Admittedly, the flanging effects are more prominent when you hear the 2 decks closer together in regular stereo or in mono, so Wide Stereo Mode isn’t always the clear first choice just because you’re running a stereo setup. Also, the cool comb filtering effects you can achieve with low Lag Times and no Wobble are mainly heard in regular stereo mode or mono. With that being said, the Deco is right at home in a mono rig either at the end of your effects chain in front of a single amp or in your effects loops, so don’t think you’re missing out by not running it in stereo. While you can use a tap foot-switch for setting Lag Time or a Strymon Favorite Switch for recalling a single preset, plugging in an expression pedal adds the most interactive fun to the Deco. You can control any single knob function via exp pedal, but the Deco is already preset to control Lag Time, arguably the most fun parameter to get crazy with. You can sweep through the range of flanging and chorus sounds up to the slapback and longer tape echoes. Quick heel-to-toe transitioning (and vice versa) lets you warp the tape syncing for extreme pitch bending sounds. You can do all kinds of wacky things that wouldn’t have been so easy to replicate with actual tape decks in the studio. The Ultimate Tape Effects Solution? The Strymon Deco is amazing at everything it does. It perfectly executes its sonic vision and provides a wealth of great sounding tape inspired effects in a single compact pedal. I can only think of a few shortcomings, the most glaring being the lack of MIDI implementation. When Strymon standardized this compact form-factor for their smaller guitar pedals, MIDI effects switchers hadn’t quite become as popular are they are today. The convenience of MIDI control on high-end digital pedals should be the norm at this point, especially with Strymon pedals considering MIDI is so well-integrated in their flagship TimeLine, BigSky, & Mobius pedals. While presets would have been a dream come true considering all the amazing sounds the Deco offers, even just MIDI program change functionality for the Deco’s Type & mode options and CC control of Bypass & knob parameters would have made a huge difference for guitarists with pro-level pedalboards and rack rigs. Yes, you can use the Strymon Favorite Switch to save and recall a single preset. But there’s just so much this pedal can do, and it’s disappointing to have to spend a gig reaching down to turn knobs when you could change sounds more easily via presets and/or MIDI. Also, while the single tape echo (or double echo with Bounce) is sufficient and adheres to the Deco’s strict vision, I’d love to have seen a Repeats control for adding additional repeats that can extend all the way into full-on tape oscillation. Considerations might have been made against this idea in favor of maintaining a familiar and less complex knob layout and/or to keep with simple reel-to-reel tape deck performance options. Of course, adding this extended tape echo versatility to the Deco might also have cannibalized sales of Strymon’s excellent El Capistan, and the company has shown reluctance to implement features in one pedal that could render another obsolete (Ex: El Capistan vs TimeLine’s similar, yet simpler dTape machine & Lex vs Mobius’ stripped down Rotary machine). While this undoubtedly keeps a greater Strymon presence on some pedalboards and keeps multiple products relevant to consumers, I’d love to see Strymon condense some pedal concepts while maintaining a full range of features to better serve the needs of end users. Come on, Strymon, release the flagship all-in-one multi-effects pedal already. Minor gripes and commentary aside, the Deco is simply stunning to behold and my expectations were far surpassed in how much I thought I’d enjoy playing it. This is some of the highest praise I can give as inspiration is priceless. The Strymon Deco is a one-of-a-kind pedal that beautifully captures the experience and sound of using twin reel-to-reel tape decks. The Deco’s collection of tape effects – flange, chorus, slapback echo, tape echo, & tape saturation – are stunning in sound quality, implementation, and ease of use, making this pedal an indispensable tool for stage and studio use. Even if your leanings are towards modern tones and effects, you’ll be pleasantly surprised at how well the Deco brings sounds from the dawn of tape recorded audio into the 21st century. While I’d like to have seen MIDI functionality, multiple selectable presets, and a Repeats control for more tape echoes, this pedal was a risky release that still greatly exceeds expectations in its current form. 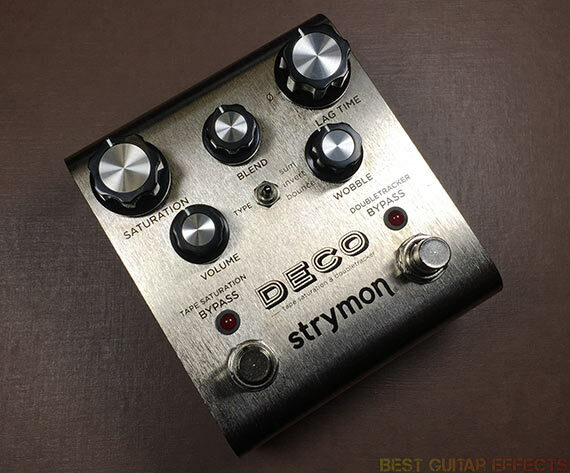 The Deco is yet another example of why Strymon is one of the most innovative effects pedal builders of today. That concludes our Strymon Deco review. Thanks for reading. 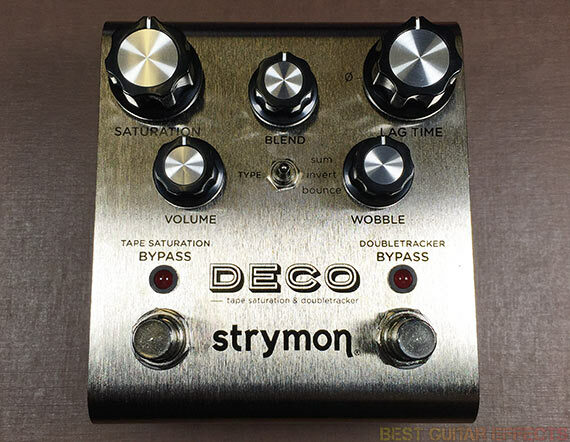 Want to buy the Strymon Deco? Awesome review of an amazing Pedal – it’s my favourite pedal and has been since I bought it earlier this year and I try to tell everyone I know into guitar about how good this thing is! Maybe Strymon should release a Deco Deluxe with MIDI, repeat delays and some favourites added as per your review as that would make it the ultimate pedal for tape effects. I love the saturation and use it instead of overdrive personally unless I need something heavier but for most sounds it’s perfect and if you want to play Chrub rock then this is your pedal! As always.. Strymon has seeked for interesting concept and compact pedals. Thou would be interesting if it would be shown in action in different styles like jazz, rock and etc. Looking forward to dig into this if I would get it some day! Thanks for rewiev!